I, Martin Gust, born 1953, operate my workshop for harps and historical musical instruments since 1988.
instruments mainly for music bands of the medivial scene, who realised their conception of design and sound properties in cooperation with me. In accordance with centuries old traditions I made harps, psalters, harpsichords, virginals, cisters, and hurdigurdies as well as organettos, small organs and clavicords. Since some years I build harps mainly in my own and historical way of construction. The most of my instruments are planned by me and developed further over the years. In this way some fully developed standard models originated, to which I also gave names. Since most customers have individual wishes I mostly build on order. The design of the particular instruments will be outlined according to a agreements with the customers, possibly generating totaly new models. I favour native woods like spruce, maple, walnut, or fruittrees. 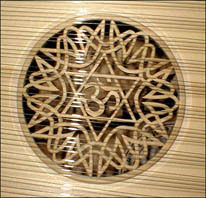 The strings for the instruments are calculated individualy.